The Ministry of Foreign Affairs and Immigration is staging the first ever Diplomatic Week next week aimed at fostering closer ties between the Diplomatic and Consular Corp and The Commonwealth of The Bahamas. Minister of Foreign Affairs and Immigration Fred Mitchell made the announcement during a press conference at the Majority Room of the House of Assembly October 15. Another goal of Diplomatic Week is to build relationships and to provide a “seamless” system when Bahamians travel abroad, said Mitchell. The twelve Heads of Missions abroad and an estimated 50 foreign diplomats accredited to The Bahamas will attend events running October 19-25. Also during the week, three ambassadors-designate from Germany, South Korea and France will present their Letters of Credence to the governor general. The week will also focus on student outreach, with Bahamian ambassadors and consul generals along with foreign service officers visiting schools in Nassau and Grand Bahama, Abaco, Exuma and Eleuthera. 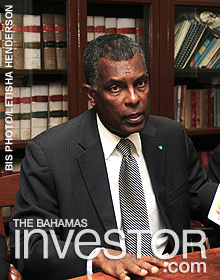 “The various Heads of Mission will explain the role of the Ministry of Foreign Affairs in social and economic development and the importance of foreign policy in advancing the interests of The Bahamas in the international arena,” Mitchell said. Also during the week, there will be presentations by officials from The Bahamas Investment Authority and the Ministry of Financial Services; and a Bahamian European Union dialogue on political and economic development, crime and security, climate change, natural disasters, human rights, the economic partnership agreement, and The Bahamas’ accession to the World Trade Organization. A signature event of the week will be the official launch of the re-election of The Bahamas to the International Maritime Organization at Grayclliff, hosted by the Minister of Transport and Aviation Glenys Hanna-Martin. The Foreign Service Act, which would incorporate the Foreign Service Orders for the Ministry of Foreign Affairs, expected to be implemented December 15, will also be discussed. iJet Charters has committed to regular charter flight services to five different Bahamian islands from April to August from selected US airports, including New York and Fort Lauderdale. Watch an interview with the founder and chief executive officer of iJet, Jim Swieter.